All families with a child who will be five years of age by September 1st, 2019 are invited to register their child for kindergarten for the 2019-2020 school year. 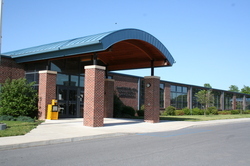 KINDERGARTEN REGISTRATION WILL BE HELD AT District Administration Office, 435 Stanley Avenue,. new students and their families! Our goal is to welcome each child as they enter our district, meet with parents and students together to review what everyone can expect on the first day of school, and share important information and resources to make coming to school a positive experience for our youngest students. Information and activities for encouraging early literacy development. Includes games and resources for children of all ages, including special activities designed for pre-kindergarten students. Games that encourage early reading through interactive and stick-with-you games which include the fundamentals of reading. A fun way for students to learn the alphabet before the first day of kindergarten! The classic educational show includes online activities and games featuring everyone's favorite Sesame Street characters. Reading is Fundamental. Includes a parents' link with tips and activities to motivate your kids to read, broken down by age. Includes online games and stories. Features articles and activities for the whole family- sponsored by Disney. Offers month-by-month information and ideas, to help prepare your child for kindergarten. Each month is broken down into four areas: Kindergarten Skills Development, Getting Ready to Read, Health and Wellness and Monthly Information Print-out. The site provides recommendations for books for children and adults as well as suggestions for useful websites. This site is offered in both English and Spanish, devoted entirely to literacy. The site is geared to families whose first language is Spanish. National Association for the Education of Young Children. Includes section especially for families highlighting resources available to them. Penn State Cooperative Extension provides materials, videos, and educational activities for child care providers, parents and employers. The link specifically for parents includes ideas for activities, snacks and lots of articles about the care of kids! please contact Elementary Services at 717-261-3417.